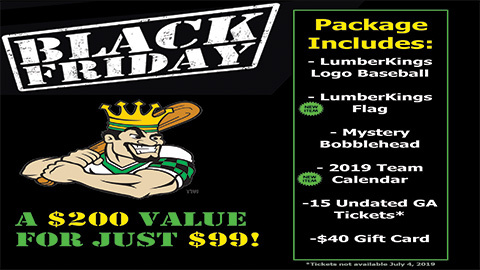 Clinton, IA (November 19) - Back by popular demand the Clinton LumberKings are excited to announce this year's Black Friday sale! Let us help your holiday shopping list with the best LumberKings sale of the year. This one-time sale will come to an end on November 30th, so act fast. This $200 package is yours for just $99! Fans can add this deal to their cart starting at Midnight (12:00 AM) on Thursday night/Friday morning by visiting the Lumber Yard teamstore. The Lumber Yard team store is open Monday through Friday from 10 AM to 5 PM (excluding holidays). The Black sale is only available online.